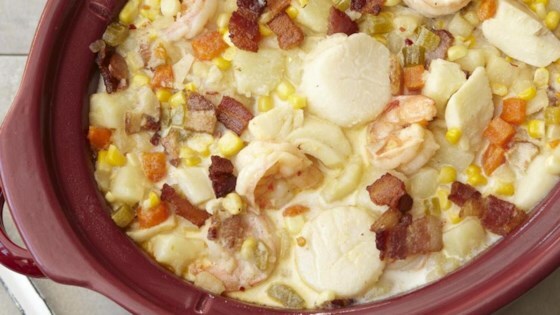 "A great, hearty fish chowder that's lower in fat. Perfect for a winter's day. This recipe is very versatile. I use low-sodium, homemade stock and I find there's enough salt from the bacon that no more is needed. You can change up the seafood, the vegetables, and the seasonings. I find seafood chowder difficult to reheat (a no-no at work!) so I would make this when I have company coming who can finish it in 1 or 2 days." Cook and stir bacon in a skillet over medium heat until browned, 5 to 8 minutes; drain excess grease. Cook and stir onion and garlic into bacon until onion is translucent, about 5 minutes. Transfer mixture to a slow cooker. Pour chicken stock into slow cooker. Mix corn, potatoes, celery, and carrots into the stock. Season with black pepper and red pepper flakes. Set the cooker to High, cover, and cook for 3 hours. Stir scallops, shrimp, and halibut into the soup and cook 1 more hour. Stir evaporated milk into chowder, heat thoroughly, and serve. Yummy! Yum! I changed a few things just because I didn't have some things on hand! Added Half & Half to make it more of a chowder type of meal. My kids and everyone else LOVED it! Used sweet potato as well as coconut milk rather than cream to make it super healthy and delicious.